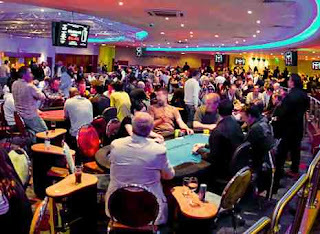 Dusk Till Dawn, not only my local poker-room but considered by many to be the best poker-room in the UK, is facing a killer overlay in its €250,000 Guaranteed tournament, which began on Monday 8th August and will finish on Sunday 21st August 2011. After breaking the record for the biggest poker tournament held in the UK this May, with 1564 players taking to the felt in the €50+10 tournament, DTD almost immediately afterwards announced their highly ambitious follow up, another €50+10 tournament which would be guaranteed at a massive 5000 entrants. The way they set out to achieve this was to have 20 Day 1 'flights', 10 scheduled on-line and 10 being held live at the club. The top 10% of the field would make it through to Day 2 where everyone would start with even stacks, and players could enter as many Day 1 flights as they desired/required until they made Day 2. It isn't hard to see that the Day 1s are really glorified satellites into what is effectively a €500 tournament, albeit one in which you are guaranteed some money back (as all those making it through to Day 2 will receive some pay-out). Perhaps it is this format which some have been either deterred or confused by. 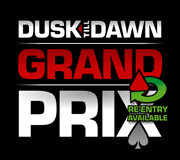 Some have argued that the beauty behind the previous Grand Prix tournaments that DTD have run (this is their fourth) was that they were pitched perfectly for the recreational players to have a one-time punt on a tournament with a good structure and a big prizepool. I think even the fishier players could be wise to the fact they are mathematically likely to fire multiple bullets to stand a decent chance of making it through to the 'real' tournament on Day Two, making it potentially out of their bankroll. So whilst DTD regularly attract 300+ players for it's monthly £336 tournament, entry to this similarly priced €500 tournament isn't available by direct buy-in. They have also made it so that you must buy-in for the live tournaments through their online software, in order to promote their online poker-room and gain sign-ups. Both of these things may end up costing them a fair few entrants. Although a whopping 9328 entries were made in May/June, and a $67,200 overlay was incurred on the prizepool, this was more than covered by the rake, and was deemed enough of a success for them to repeat the tournament just two months later, albeit with a couple of tweaks. They made the July/August tournament,which was attached to the WPT Legends of Poker festival, a $125+25 buy-in, and allowed each entrant 1 optional re-buy. This ended up attracting an absolutely massive 13,178 entries and $1.45 million prize-pool. So the evidence suggests such a format could work, so perhaps if DTD were to tweak a few things, then Grand Prix V (should they choose to run it), could be more of a success than it appears IV is going to be. Perhaps they could also allow for an optional rebuy next time, and perhaps merging the online and live domains for one tournament wasn't the best idea...although extra online tournaments are now vital for reducing the potential overlay as much as possible. The figures for the Day 1 flights at Dusk Till Dawn, and on their online site, have been disappointing, and have obviously fallen far below what they were anticipating given the huge potential overlay. Based on the numbers they have so far, a €120,000 overlay is being projected. Not exactly what owner Rob Yong wants to hear whilst trying to enjoy his holiday in the Caribbean! In an attempt to reduce this potential overlay, DTD have added 24 extra Day 1s on-line, so are now running four tournaments in the evening at 7pm, 8pm, 9pm and 10pm for the rest of the week, until Day 2 commences on Saturday 20th August. They have also made all the remaining Day 1s (live and on-line) available for re-entry into the same flight. Yours truly was fortunate enough to qualify for Day Two in his first attempt in one of the online tournaments (wiiii I got a sick brag in). Technically it would be within my best interests for the overlay to be as big as possible (as this would mean I have to fight through less opponents for the same prizepool), but I have no desire to see Dusk Till Dawn fail, and for them to be stuck with a huge bill. Ok, you could argue that it is their fault for being overly ambitious, but it is for this reason that the venue even exists, and why it has raised the bar in terms of poker in the UK. Although I'm mostly an on-line grinder, it's nice to have such a great card-room within an hours drive. Depending on your interpretation of the tournament, you could say with 100% satellite entries, this could be the softest €500 tournament field you are likely to ever get, so if you are in the UK, support Dusk Till Dawn and check out how you can play here. 0 Comment to "Dusk Till Dawn facing €100,000+ overlay..."